In the age where intercontinental travel is easy and relatively quick (no, it's not like we have just arrived there), we take certain things for granted. We no longer have to carry portable, yet somehow huge DVD players on the plane - we have in-seat entertainment systems; no need to worry if the ground crew packed a couple of bottles of our favorite whiskey - we know that it will be there. Stuck at an airport due to a snowstorm and you're hungry? Plenty of restaurants around, or even snack shops (highly overpriced for reasons unknown to most of us). But we aren't the only ones who take lots of things for granted when traveling. Airport officials, ticketing agents, baggage crews and airport security take lots of things for granted too. Lost at the airport? Tough luck, everyone just expects you to know how to find your gate, or your luggage, or your mother-in-law. Although you might want to leave the latter behind in hopes that she will never find her way back home. The ticketing agents expect you to be at the gate on time - no one cares that you were having such a good time at the lounge while sipping on your chilled gin and tonic. And airport security? You better have your passport and boarding pass in your hand, shoes off, belts out when approaching them. Yes, they love it! "You forgot to take your laptop out of your carry-on bag? Get back at the end of the line!" For the most part, our modern-day system seems to be working. People know not to have any liquids in their carry-ons, they don't even get offended when they are selected for a pat-down. And yet, every once in awhile there is some bloody idiot that brings a gun to the airport. And he wants to take it on board! Some flight attendant tried smuggling nearly 60 pounds of cocaine through the Los Angeles International Airport not that long ago. And we're complaining that the TSA is too harsh on us, travelers. 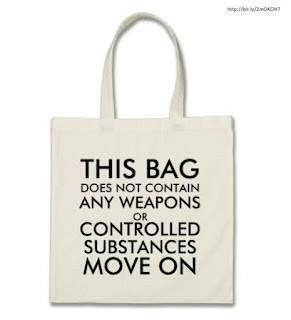 And of course, you can the above-mentioned bag for yourself. It comes in many sizes, and maybe shapes?. Just click right here.